I haven’t made a Driver is the driver joke in a while. I missed driver, too! Best girl. Wait, how’s he going to get it across the ocean? He hates boats, and he’s not going to FLY that thing…is he? Hmm. Maybe they’ll just drop it off at the Garrott estate? Didn’t Boss eat one of her eyes? Unless she somehow got her vision restored, she doesn’t have any depth perception, which would be a very bad thing for a driver. 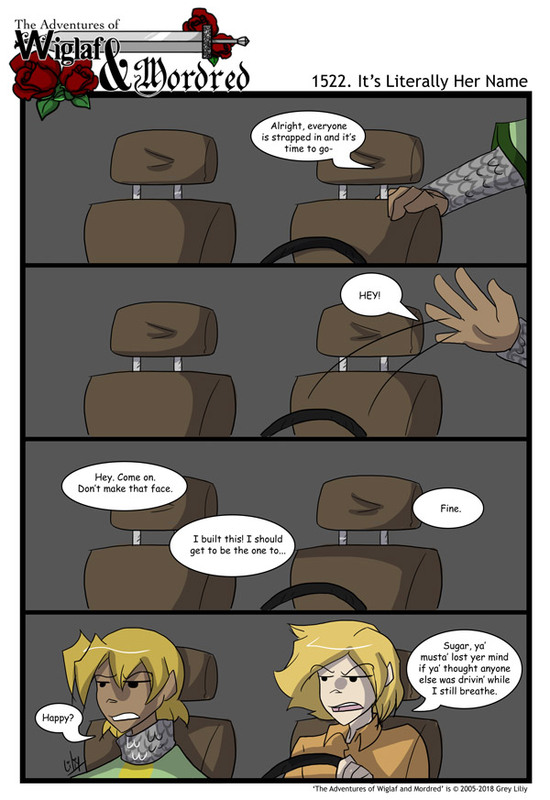 How has Driver not gotten Wiglaf out on a date yet? Also, does Wiglaf even date? Or did the whole him being perfect thing chase away the ladies like others he tried to befriend. Also, how come we’ve not seen him hanging out with his other dad after learning the truth? So many question so little answered. It occurred to me while rereading the comics, but Wiglaf acts like the artifact owners when he doesn’t have his chainmail. Was it at some point going to be revealed as an artifact before the current arc going on? It was not. His chainmail is not an artifact. He just really, really likes it. Cool. Thanks for replying and answering. So out of curiosity, is there an artifact that can show what a person can become if they were to turned into an an artifact? And even if not, what kind of artifacts would the main cast be turned into, hypothetically? I’m kinda curious if Camlann could even be turned into an artifact what with his being human now. Though if so, why Boss didn’t have him turned I could only guess was because it would’ve cost too much. No, no one knows what a person will turn into until it happens. Camlann has enough magic of his own that I think trying to turn him into an artifact would go very, very badly. Blonde Driver surprises me every time. It’s gonna take some getting used to, having her match Wiglaf so well. Mordred might get jealous.